Got your own traffic management sorted but still want quality Traffic Management Plans and Traffic Guidance Schemes, permits and notifications organised for your works? 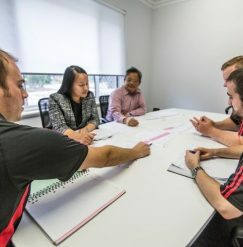 You can still contact our QTM Engineering team directly to discuss your needs and expectations for the development of Traffic Management Plans and facilitation of all necessary planning requirements. Traffic Management Plans go above and beyond industry standards and expectations. Our young dynamic team develop plans with ‘Best for Network’ principles using AutoCAD software to produce detailed drawings and reports. Where possible we visit the site first to enable us to approach the task with a personal understanding not always possible through office-based work alone. We ensure that all our plans are sent to the relevant authorities to obtain proper approval before a job commences and adequate notification is given to the emergency services. These measures ensure that all stakeholders are aware of our proposed roadworks and can plan accordingly. Our team is regularly reviewed by our in-house Roadworks Traffic Manager (RTM) and liaises closely with our QTM Traffic Management team or your own traffic management team to ensure correct and efficient implementation of the plan. Although QTM Engineering works as its own team, offering traffic and transport engineering studies, auditing and assessments, its links with QTM Traffic Management ensure that the Traffic Management Plans produced are ‘real’ and meet the latest industry requirements. Equally, you and QTM Traffic Management can rest easy in the knowledge that the best team in the industry is putting together a design that will ensure safety, incorporate the latest industry standards, demonstrate ‘Best for Network’ thinking and cutting-edge quality traffic management. Have a look at the comprehensive services offered by Quality Traffic Management or contact us directly to find out more.